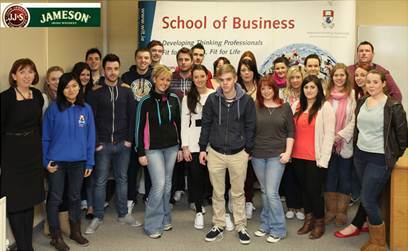 Final year students from the Bachelor of Business Studies (Hons.) and the BA in Tourism Marketing (Hons.) programmes recently battled it out for first position in a ‘live’ competition organised by WIT School of Business and Jameson. 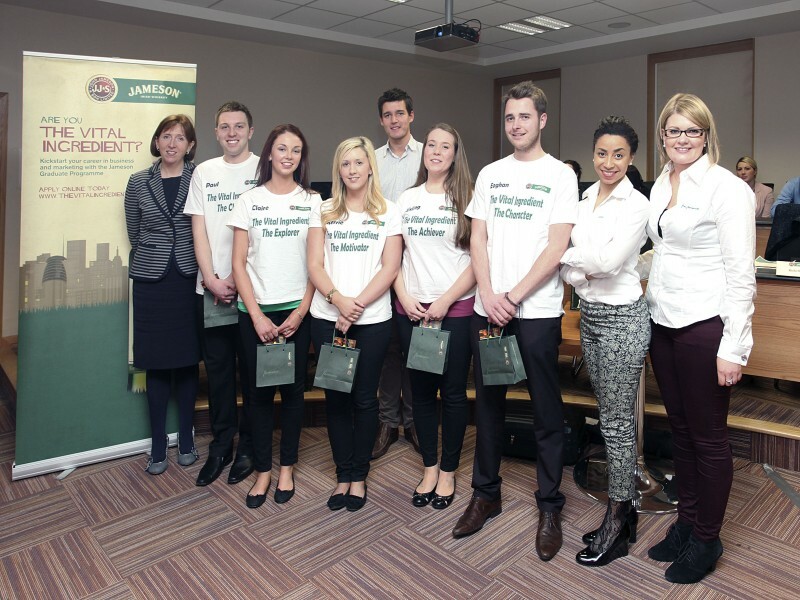 Jameson gave the students the opportunity to embrace their creative side and develop a digital advertising campaign to raise awareness of the Jameson Graduate Programme (The Vital Ingredient) among third level college students. The project represented an innovative approach to student learning as it provided participants with the opportunity to directly apply theory to a real business situation, to present their recommendations to an employer and to receive direct feedback on these recommendations. As the project brief required students to make recommendations on how traditional and digital media could be used to promote the Jameson Graduate Programme, students really benefited from developing their digital marketing skills, which employers increasingly seek from Business graduates. Eileen O’ Connor, a final year Bachelor of Business (Hons.) student commented “I can’t praise this live project enough. As a mature student with previous work experience, I am very aware that what is learned in class is only half of what is required to get the work done. This live project brought the academic material to life. One sentence about rejecting good ideas in order to get a great idea in practice entailed many weeks of artwork and brainstorming. A paragraph about listening to the client’s brief and researching the project became a month’s worth of surveys and secondary research. This was the most enjoyable module of the marketing course because it allowed us, as marketing students, to explore our own creativity. Creativity is a key skill required by marketing employers. New teamwork skills regarding working with creative people and creativity were learned: We created a positive working space where all ideas were valued and praised but then compared to the brief and accepted or rejected accordingly. This prevented power games which can affect creativity. The right idea became more important than an individual’s personal investment in their work. The goal of the Jameson prize kept us focused on performing as a team and not as individuals. The project has enhanced students’ learning experience, has helped improve their employability and has raised their commercial awareness, through hands-on experience with a multi-national company. It allowed students to gain experience in the world of advertising design and media buying, by putting theory studied in the classroom into practice. The winning group, ‘Synergy’ (pictured below) consisted of Aisling O’ Dwyer, Kerrie Ryan, Claire Williams, Paul Connolly and Eoghan O’ Connell from the Bachelor of Business (Hons) programme. The collaboration between WIT and Jameson was initiated by Angela Collins, Career Officer, WIT and the project was managed by Marie O’ Dwyer, Marketing Lecturer at WIT School of Business. “This project offered a unique opportunity for Irish Distillers as an employer to engage with students in a meaningful way. It offered us the opportunity to engage students in working on a real issue we had within our business which required them to apply the knowledge they developed through their formal lectures to a real business case. Creativity is a key skill required by marketing employers and this project allowed students to develop this key skill and raise their commercial awareness.